These are times that cry out for true leadership in the body of Christ. Emerging is a remnant whose calling is directly from God, with the leadership mantle of Joseph and Daniel, who are facing the realities, paying the cost, and faithfully stewarding their callings of bringing forth God's kingdom. These are the ones who will receive the keys to release His kingdom in their domains. These are the ones with the heart of a king. In Morris Ruddick's new release, The Heart of a King ($15.99, paperback, 978-1-61579-769-1), readers will gain a glimpse into what is contained within the heart of a remnant destined to bring societal transformation. 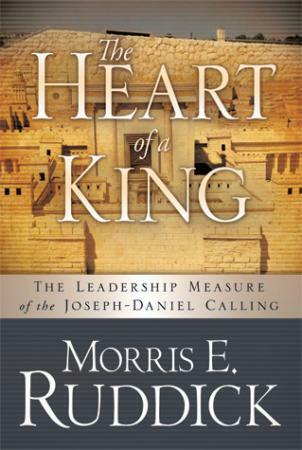 "The defining dimension to the calling described in this book is the heart of a king," the author says. "Modeled after the calling of Joseph and Daniel, against all odds, those bearing this calling will change the course of nations. The heart of a king is not patterned after the ways of the world, but according to a mantle of leadership outlined by Jesus' kingdom message. Based on the kingdom model which aligns the spiritual, entrepreneurial, and community riches of God's glory, this measure of leadership will differentiate today's heroes of faith." Since 1995, Ruddick has been a voice encouraging and mobilizing kingdom business leaders and entrepreneurs. With more than 30 years' experience as a senior management consultant to multinationals to major ministries, he has also led development of entrepreneurial activities in critical needy areas and brought together business and ministry agendas in several nations. His kingdom agendas reflect a unique merging of the secular and the spiritual--an interlinking of secular business enterprises with overriding kingdom objectives. Xulon Press, a division of Salem Communications, is the world's largest Christian publisher, with more than 7,000 titles published to date. Retailers may order The Heart of a King through Ingram Book Company and/or Spring Arbor Book Distributors. The Heart of a King is available online through xulonpress.com/bookstore, amazon.com, and barnesandnoble.com.